Hi. I will be criticizing a book for the next three weeks. ""For once in his life, Jimbo finally shut up!" In Girl, Stolen, Two characters by the name of Jimbo and TJ get into an argument over whether or not to shoot Griffin. In this conversation, they reveal that Roy killed Griffin's mother. In the end, TJ has enough of Jimbo's insults and shoots him. This quote shows that TJ is a terrible person, and does not mind killing people. Then again, the man he shot was Jimbo, who provoked TJ into getting in trouble multiple times. 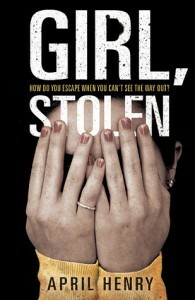 My name is Billy, and I'm rereading Girl, Stolen by April Henry. It isn't a particularly good book, but sometimes you just want to laugh at some ridiculous or over-the-top characters. I've gotten to page 197 so far, and a second read did not help my liking of the characters. The melodramatic nature of the book does not help. It seems like such an interesting concept- a blind kidnap victim- but the idea doesn't work. What you get instead is a number of forgettable characters that act so irrationally it's funny.